Chatbots have hit the big time. These computer plug-ins - powered by AI but designed to chat like humans - are making their way across Facebook and Google and adding a new layer to the digital assistant apps we've all got used to. 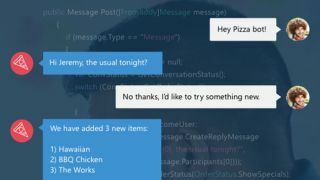 Now it looks like Microsoft is building a 'Bing Concierge Bot' designed to offer help and assistance wherever you need it, across a multitude of apps (from Skype to WhatsApp), the details of which were leaked in a job posting picked up by ZDNet. Microsoft already has Cortana, of course, but the new bot will live inside messaging apps to serve your every need. The job listing gives the example of making a restaurant booking via the bot rather than using a separate app like some kind of technology philistine. Microsoft declined to comment on the story but already has a bot framework in place that enables developers to build these kind of tools. It looks like the company wants a bot of its own too, powered by Bing and third-party plug-ins. Like Google Assistant and Facebook M, much will depend on how slick the external integrations are (with restaurants, cinemas, taxi firms and so on). They're referred to as "service providers" in the job posting put up by Microsoft. "The agent does what a human assistant would do," reads the listing. "It runs errands on behalf of the user, by automatically completing tasks for the user. The users talk to the agent in natural language, and the agent responds in natural language to collect all the information; once ready, it automatically performs the task for the user." Would a 'shock clock' get you up earlier in the morning?